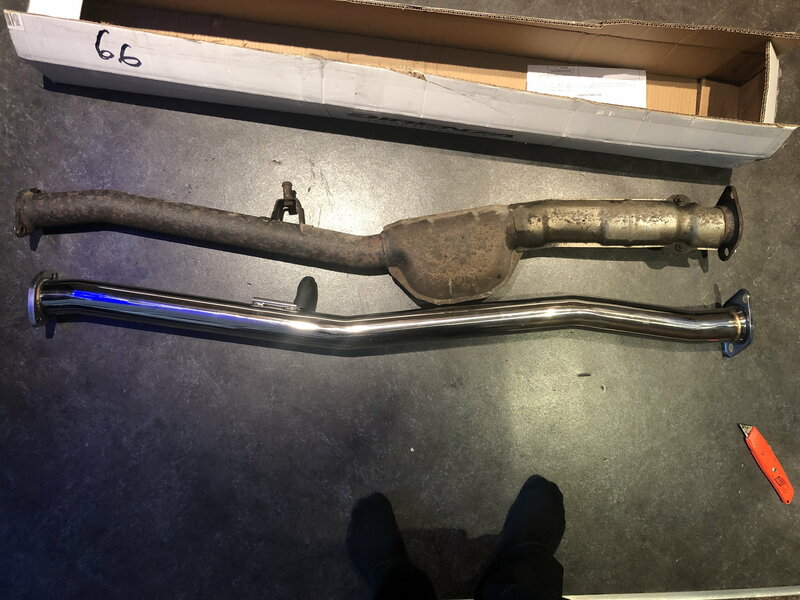 I need to get a new Centre Exhaust section for my 2004 Impreza STI Uk Version with PPP pack. The Car has standard exhaust with whatever the PPP prodrive upgrade is. It has prodrive on tail pipe but not sure what else they changed in the PPP pack. I have looked on line as stainless options and find so many option it confusing as some mention they are centre decat pipes there are one with resonators and ones without. 2.5 ", 2.75" and even 3" but most say for off road use only. I am not trying to alter performance or noise level just looking for a road legal (Emissions) stainless steel "centre section" replacement only. A big standard 2.5 inch with standard resonator will be ok.
Any of the breakers on here will help. Last edited by dark_angel; 25 September 2018 at 07:17 AM. Reason: I'm stupid. Something like this will be fine. The standard exhaust is 2.5", non resonated will add abit more noise but will only make the car sound nicer. Got a standard centre section if needed. Hi thanks for the advice and offers. i am thinking of getting a stainless steel pipe section so it won’t have to be replaced again. Just have to decide between resonated or non resonated ! If I go for a non resonated pipe section (as it’s cheaper) will it mess up the ecu PPP mapping ? Nah mate. I have changed my full exhaust for 3" bore stainless steel manifold, and sports cat and prodrive ecu and performance filter car runs fine. Such a small change like that won't do much. I have the PPP on my 2003 & I can't help but think the back box strangles the burble as it only seems noticeable between 2-3k RPM & then a seems to get muffled. Would swapping out the centre section for a non-resonated one free up more of the burble (or rumble, whatever the technical definition if for it)? For some reason I have it in my head that going non-resonated increases drone but maybe that's just a side effect. i will let you know as read something similar about drone in the car. i now have all the parts to have it fitted next week. spoke to my local exhaust centre mate and he reckons if I get drone due to it being a straight ish tube with no shape (ie resonator box) he said just wrap it in that woven heat shield tape and that would deaden the drum !! Yes will improve the sound nicely. I have a powerflow system on mine which is 3" bore no resonator and just a back box similar to the prodrive. Mine has a nice note, not much drone, I've had multiple systems on mine, worse for drone was a jap style awful. With the prodrive it should be abit quieter than mine. Can't imagine it would have drone. The back box I had my eye in was the Hayward & Scott angled Jap Style which I am not expecting to be quiet. I am thinking now I should swap the centre section first & see what effect that has. I like the look of the Prodrive back box as it looks stock & doesn’t draw attention & if I can get decent sound with it & a straight through centre section that make everything a little more straight forward. I similarly went with a 2.5" stainless non-resonated centre in my STi PPP. Nothing but good things to say about it - louder, but just enhances the sound nicely. No droning, well certainly no more noticeable than standard. Would you guys say the non resonated center section makes it louder and raspier? I‘m looking to replace mine, too (2005 STi PPP). It‘s non resonated and with the back box (S202) comes out a little on the loud and raspy side with a little drone at motorway speeds, so I think it depends a lot on the rest of the exhaust system, too. Got a standard resonated centre pipe if interested top pipe in picture. Did the straight center pipe make a difference in sound? I'm exactly in the same situation as you were, I have a 05 STI with Prodrive muffler and it is very very quiet at full throttle. With the non-resonated centre & Prodrive back it's not really any louder (only a fraction), it just just the tone has a deeper not & the rumble burble is more prominent & doesn't get swallowed up by the resonator. You'll be best off swapping out the centre section & back box at one time to save messing about later if noise is the main goal. I see, so still very quiet after 3000 rpm? My mechanic who is a subaru olspecialist and fanatic told me that removing the center resonator wouldnt make any differece, I guess he is right then! I agree, I have a stock STI PPP and recently changed the middle resonated pipe for a straight pipe hoping for more sound, and I'm disappointed, I don't notice any more sound under hard acceleration, what I notice is a bit more drone on the motorway. I might have to change the backbox for a louder one.